Perhaps this veteran’s big claim to fame was that he was sent to Seoul to fetch the Japanese government officials there back to Tokyo—they came peacefully because they were afraid the Koreans would kill them. Meanwhile his buddy flew the first Americans to Hiroshima to study the damage. While the veteran said he always felt safe, others in the audience piped up to remind us he had to fly without proper maps and even in bad weather. The veteran was in the first group of American planes to fly into Tokyo after the war, but was the only one to make it as he noted a landmark and altered course while the others depended on their improper maps and crashed. I don’t know what kind of program the veteran used to make his film. He divided his story into three parts and showed us Part II. Part I was about his training and Part III was the notorious nose art—I think he sent a copy to a museum somewhere. A few years ago, I made a set of family-story movies using the free Windows Movie Maker; Macs have their own version. The movie I made is the flipside of this veteran’s story, that of a Japanese-American internment experience followed by what it was like to live in bombed-out Hiroshima right after the war. I edited a lengthy videotaped interview, broke it into sections, and incorporated photos and added a little bit of music during the titles and the ending credits. Windows Movie Maker is a pretty amazing program for being free. See my old blogpost Windows Movie Maker Makes You Look Professional. I should write an updated version. Veterans Day is tomorrow, and November is National Life Writing Month. Maybe it’s time to capture your favorite veteran’s stories. Be sensitive to post-traumatic stress, though. Me, I’m putting together a Korean War memoir for a new friend. 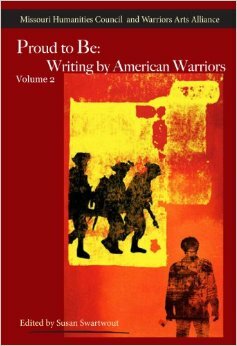 In July I submitted what I had done with Chapter 2 so far to the Proud to Be: Writing by American Warriors, Vol 2, anthology and it was accepted! My friend is excited and will read an excerpt this Friday at one of the book release events. If you’re in St. Louis, stop in and listen to some powerful stories – see the Warrior Arts Alliance Facebook page for info. There will be a Volume 3 next fall, so if you know a veteran, warm up your typing fingers or let him or her know to get writing! See Lifewriting Questions for Veterans under the Resources tab above to get started. Salute to all veterans! Thank you for your service. This entry was posted in capturing memories, history, honoring veterans, war stories, WWII and tagged war stories. Bookmark the permalink. Your post is warm and appropriately sensitive towards our underappreciated veterans. As WWII veterans leave us, only stories like yours preserve them for the future. We must remember – or learn – of their sacrifices so that we can enjoy our life of comparative luxury today. Yes, our combat veterans in particular have been through times unimaginable for the rest of us. Working on this Korean War memoir, I hesitate to complain about anything in my little comfy life.